Swedish fish, watermelon, strawberry, and blue candy. 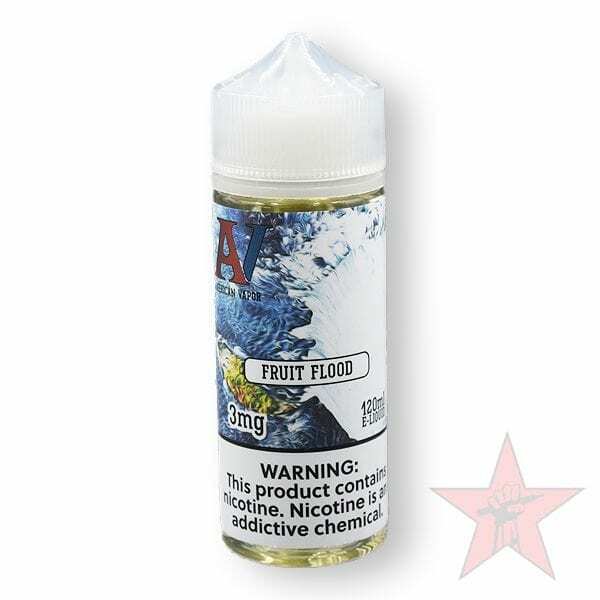 A candylicious combination of Swedish Fish and hard candy with a fruit flood of Blueberry, Watermelon, and Strawberry. I love Swedish Fish and this juice did not disappoint. Very good flavor! Sweet but not overpowering. Got this in 6mg love the nic kick plus the sweet taste of it. Got it from a local shop. Can definitely recommend. I was iffy about the Swedish fish part, but it is bomb! It is not overpowering at all and leaves a great taste. My new go to juice! This is definitely one of AV’s strongest candy fruit flavors. If you love the taste of Swedish Fish, you can’t go wrong with this one. One minor downside is, much like its similar sister flavor Muse, Fruit Flood has a bit of a flowery/perfumy aftertaste, but it’s very pleasant overall. This has been my favorite and my go to for months. Bottle after bottle and I never get tired of it. Any time I try to switch it up it just doesn’t compare and I end up back with the fruit flood. Bold fruity flavor but not overpowering. Use this as your daily driver and you won’t be disappointed. A blast of bold candy flavor, just as described. It’s such a great flavor and you can’t beat the price. Dragon fruit, strawberry, and light cream. Blue raspberry and pineapple hard candy. Ice cream, fruit ring cereal, and strawberry. Cheesecake, peanut butter, chocolate, and marshmallow.